Happy happy November. We wrapped up our Farmers Market season last weekend with smiles on our faces, snow on the ground, Positive Vibrations on the radio, and Cycle Farm-grown produce all over the place. It feels good to pack up the market and start putting time towards other things. We learned a lot this summer, selling at the market both downtown and in the Park. Spearfish certainly has a unique market – and we are lucky to have it. Big thanks to everyone who came downtown on Friday nights, and later Saturday mornings, to visit with us and pick up vegetables. Thank you for your support. We look forward to seeing you next year. Here are some photos from our very last Farmers Market in Spearfish City Park. It was a slow day, but absolutely beautiful in the snow and sunshine. Halloween fell smack in the middle of a long week of stacking strawbales and spreading mud slurry primer muck all over. It almost got lost entirely. We could have easily resigned to dress as weary farmers, with our ready-made costumes: mud-caked pants, sneezy, dust-crudy noses and prickly, straw-pokey socks. Somehow that didn’t seem like quite enough of a merry celebration. So with haste and determination I made a mask. An up-side-down face. It’s not much, but it has proven itself pretty useful. For instance, Jeremy pulled out a few leeks for potato-leek soup. This made him very happy. See. Happy Halloween! And a quick greenhouse update. Last week we got the strawbales up for the greenhouse walls. Jeremy made a bale needle for sewing custom bales to fit the odd spots. Our good friend Tom helped with the loading, unloading and stacking of the bales. They went up like heavy, slippery legos – shedding prickly straw bits into our socks and pretty much everywhere. 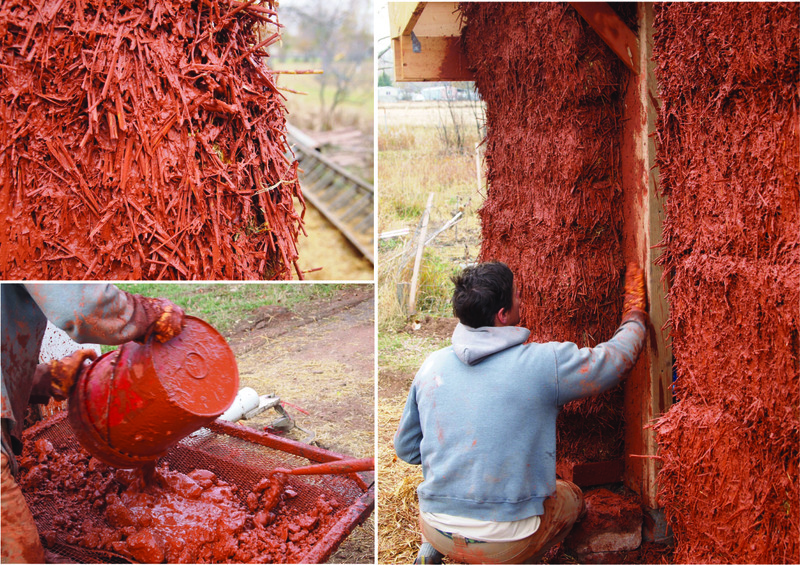 Once the bales were stacked, straightened and secured to the framed structure, we started packing muddy straw to fill holes and gaps. Then we sprayed on a very messy clay slip primer coat. This is a thin coat that went on before applying the thick plaster which will get us through the winter. Our plan, at this point, is to do a final coating on the outside walls in the spring. 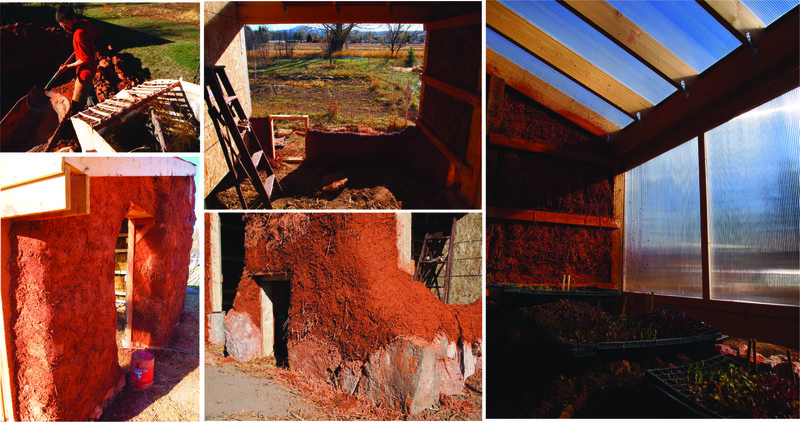 We’ll try and finish the inside cob work this winter as weather permits. The clay came from the hill behind exit 14 here in Spearfish. It is of the Spearfish Formation, a red clayey mudstone/sandstone which is Permian-Triassic, 250 million years, give or take. This is very exciting. At this point North America, South America and Africa were cuddling together right at the equator. The Spearfish formation would have been deposited in a low-energy, flat coastal desert environment. Maybe like today’s Persian Gulf in the Middle East. Iron present in the sediments would get wet then dry and wet and dry, oxidizing into this crazy brilliant beautiful red. Makes you want to sing. Makes Tom want to raise the barn. Jeremy has started on the thick plaster work (see below). 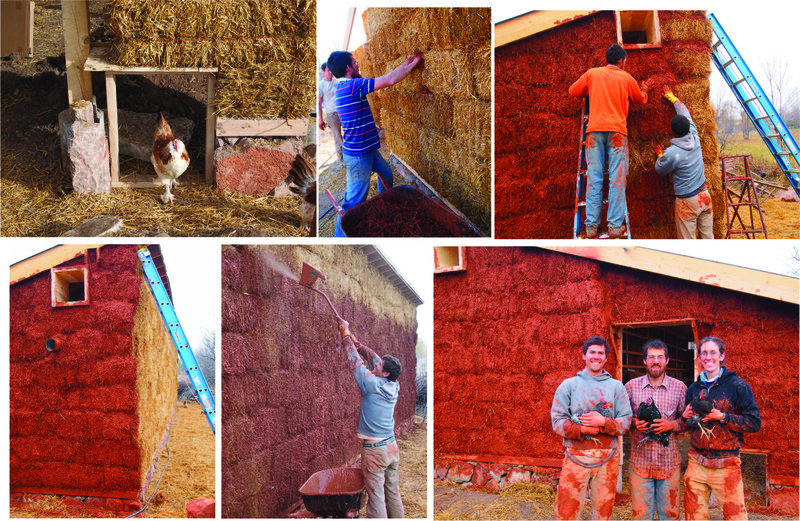 Not ever having done this before, we certainly see the merit in hands-on cob-building workshops and trainings. Our hope is to use the greenhouse to start seed trays in the spring and be growing produce in the ground by the summer. There is no end to a good thing. This entry was posted in farm update and tagged greenhouse, market by Cycle Farm. Bookmark the permalink. Your clay/straw/greenhouse is beautiful! What a wonderful accomplishment, Trish and Jeremy! Thanks Michelle! We are in cram-mode trying to get things done while the weather is so lovely. Please tell me it’s almost time to relax.. I can’t wait to have time to sit and decompress with you. Hope things are going well with you guys – I love reading about your greenhouse sproutings! Yes! I just read this post THREE TIMES and am still smiling like a GOOGLIE EYED GECKO. Regina – you are ridiculous and sweet. You make us feel like superstars, thanks for liking the photos so much. We;ll have to put together an album for you – print, for when the power goes out. OR BETTER YET: to hell with the photos – you could move here and see the farm EVERYDAY. And we could hang out and grow food and have dance parties in the kitchen! I like this option best. See you, chica – NEXT WEEK. oh hey – and while we’re tallying up the numbers I just got a notice: our website has just got 50 “likes”.. I think those are all from you, Miss. Like-happy Regina. You know: we sure do like you too. I’m a big fan of exactly ALL of these options. I will send a printer and myself on a jet plane to Spearfish, after next week. I may or may not be bringing 2,102 pounds of pasta-making equipment (I’ll drop this subject soon, I promise) and Mille-dog. Ah pasta equipment! YES PLEASE! We have a pasta maker, dear beloved noodler garage sale treasure – but the blade roller on it has gone cockeyed. Jeremy keeps saying ‘oh geez, we should fix this’. but then we deal with shoddy noodle cutting, put the roller back in the closet and forget about until the next pasta night. And then Jeremy goes ‘oh geez, we should fix this’. It’s samsara. LAUGHING MY BOOTAY OFF about the “likes”! I was even just thinking, a couple seconds ago while reading a particularly cute comment from someone else, “Dammit! I wish that had a ‘like’ button!” OH GEEZ. I need social media therapy.